Posted November 14th, 2012 by Jan Meissner & filed under Quick Projects. I’m in Ohio currently and it’s 40º outside. The only chore left in the garden is to pull leaves out of the chilly waters of my fountain, which explains why I’m at my computer sharing indoor projects. I’m not a cold hardy perennial. I’m sure my solitary fountain fish won’t mind if I ignore his habitat a little longer. His body is nearing popsicle temperature anyway. The sideboard (above) was in the basement just taking up space, and the armoire that used to house our old TV didn’t fit the new flat screen. So I hauled the sideboard up from the basement. The shiny neoclassical look didn’t work in our bedroom at all. So out came the paint. Two coats of Annie Sloan Chalk Paint in Old Ochre. Followed by two coats of Old White. Then I went back over the top and painted stripes in Old Ochre in every other indentation detail. I sanded the edges to reveal the old finish beneath and waxed with clear and dark wax. Chalk paint can also have an industrial look. I pilfered a laminated oak TV stand from my son’s room when he left for college. The modern clean lines were right for an end table in my office, but the color was bad. You know that color right? It was in every 80’s kitchen. 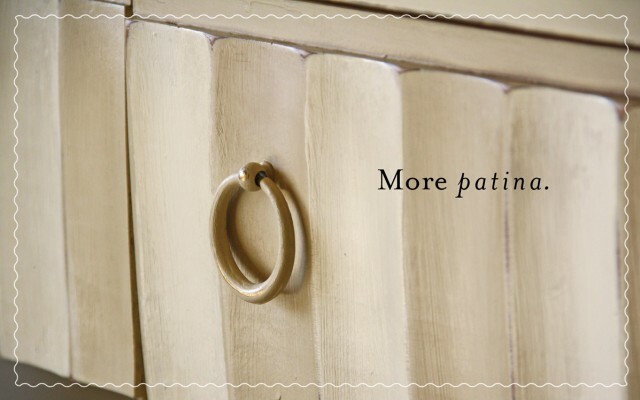 Chalk paint is great because you don’t have to worry about stripping the old finish off before you paint. 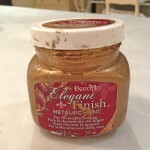 If you try this on your kitchen cabinets, don’t expect to paint over old peanut butter and jelly smears or anything, but a good washing is enough to allow chalk paint to stick. 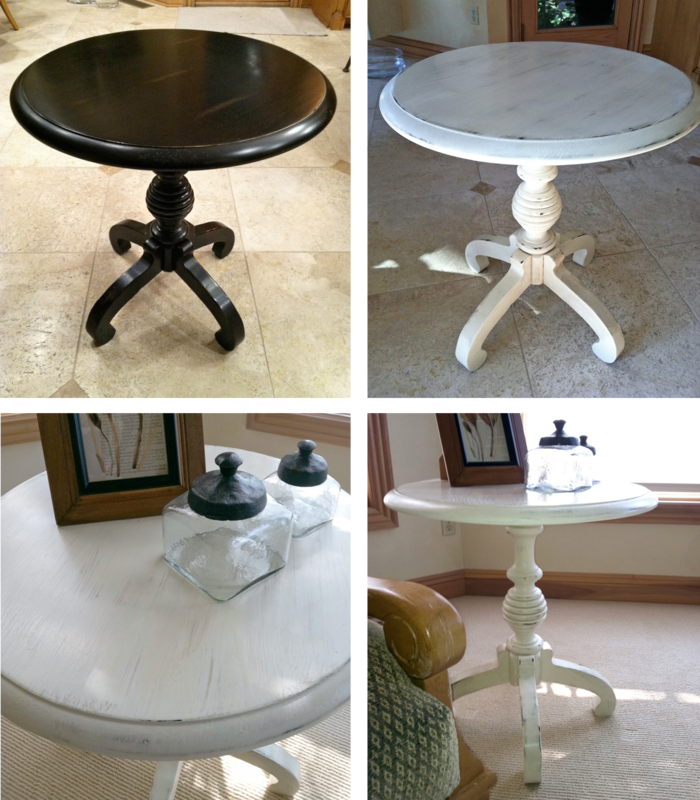 I used Annie Sloan Chalk Paint in the color Graphite. Two coats. Then I sanded the edges so it would look a little beat up, followed by dark wax, and some hand buffing. When I put the shelves back in, I did scratch paint off. No big deal. The goal of this paint is to have imperfections. Patina. The leather couch has patina too. Kitties have left their five finger scratches when jumping off of it and I treasure those little marks. I just touched up the scratches on the table with a little brush and paint, re-waxed the spots, and it blended right in. I hope to replace the plastic casters with some industrial casters to give it more of a loft look. One of the advantages of going for a distressed look is you can paint sloppy. In fact, you can refrigerate the paint, which thickens it, and it can be spread with a spackle knife. I haven’t tried that technique but I learned about it from Robyn Story Designs where I purchase the paint. 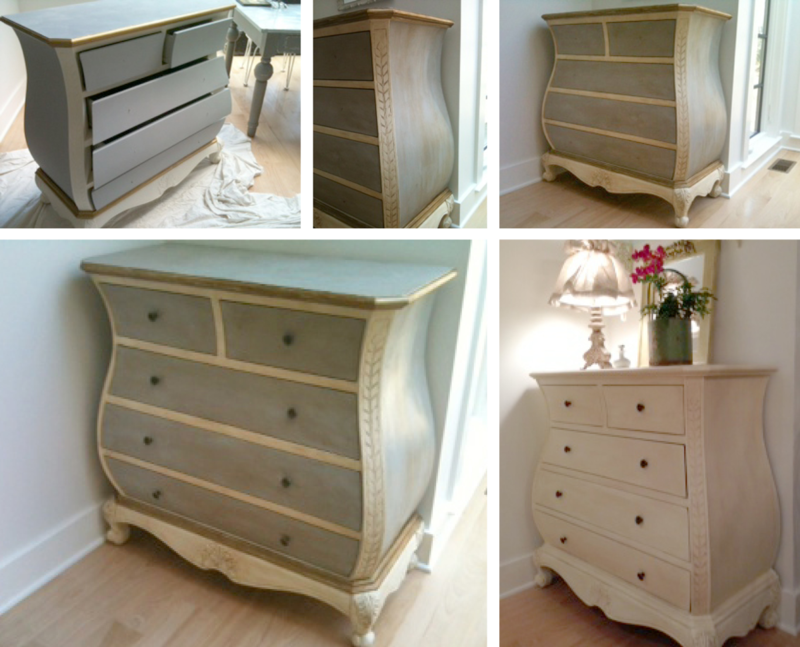 This beautiful dresser was painted by my friend Karla. She’s a master. She’s also a master mind-changer. She went through all the effort to create the two color masterpiece only to repaint it to the softer neutral all-white. In fact, she has two identical dressers flanking either side of her kitchen conservatory so she had to paint both of them. It all looks pretty awesome. She’s addicted. The pieces below are just a fraction of what she’s painted. The gold edge in the secretary is a beautiful detail. You can pick up metallic paint at any Michaels craft Store. 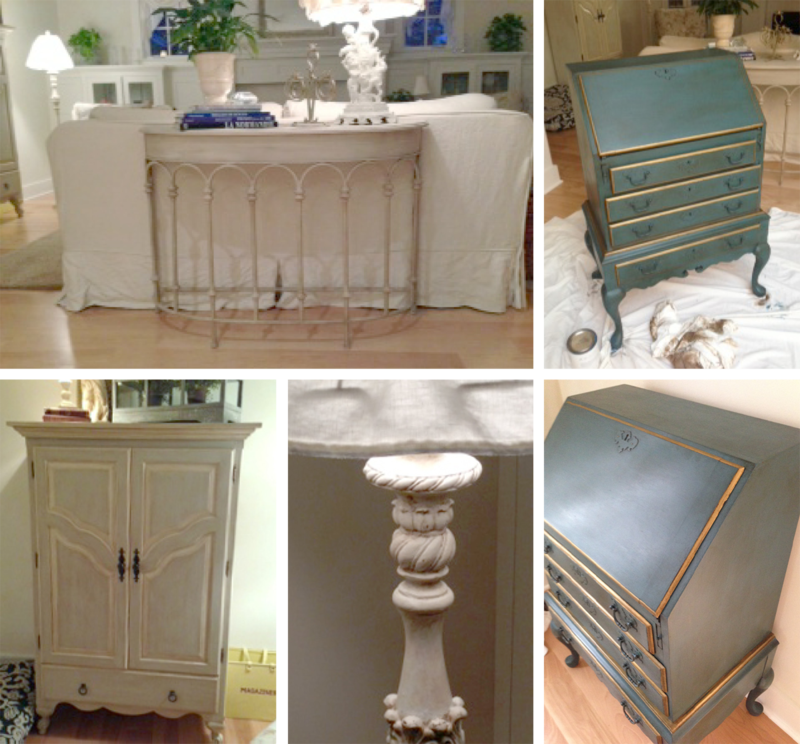 The palette of Chalk Paint is rich and diverse. You can make almost any color you want by mixing them. The whites can be added to any color to create softer pastels. And the Graphite can be added in small amounts to “dirty” colors if you want something less vibrant. The cherry cabinets in the Florida master bath were pretty but they are in every room. I just wanted something lighter and brighter. I changed out the hardware and also changed the faucets to match the hardware since this photo was taken. It deserves a new counter top too. The double doors to the master closet below are hollow core doors. I jazzed them up with a 50/50 Versailles and Duck Egg Blue mix. The door on the right is waxed. The door on the left was before wax. If you don’t want the aged look just use the clear wax, no dark wax. An inexpensive resin mirror from Target in my Florida home got a face lift. I relied on the original color to show through for the dark color, then added layers of Old Ochre, Versailles, Duck Egg Blue. The final coat was Old White. I then sanded to reveal all the colors beneath and waxed with light and dark wax. 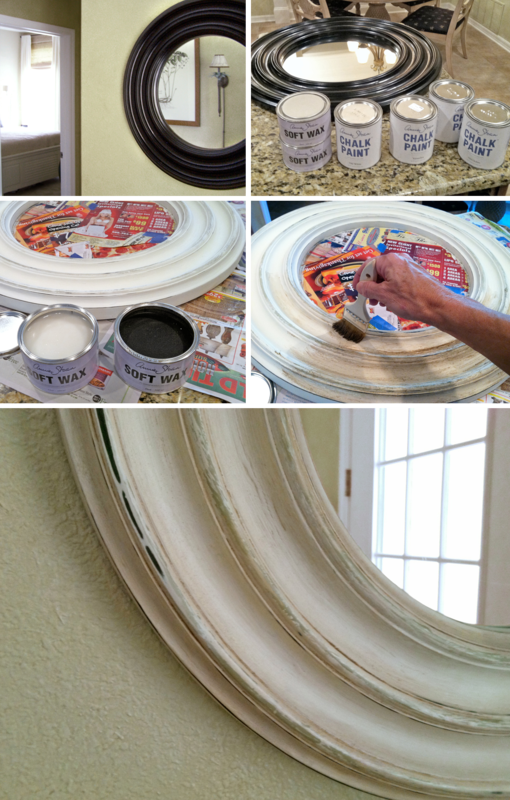 Inexpensive mirrors usually use Plexiglas mirrors so be sure to protect it from the paint and sanding. They scratch easily. This was my first Chalk Paint project. I love the “before” finish but I was moving the table to the master bedroom. The same room as the TV stand at the beginning of this post. The espresso finish didn’t work with the existing furniture. I used two coats of Old Ochre followed by one coat of Old White. I sanded the edges and some of the surface with a mouse sander to reveal the colors below. I used clear wax and while it was still moist added dark wax sparingly. Don’t worry if you get too much dark wax. Light mineral spirits on a soft cloth takes it off. You can even use a little mineral spirits mixed with the wax to make a glaze, which you can brush on and wipe off. The glaze hangs up in the grooves. Sometimes I paint things just for the sake of change. Will you show me the candelabra when it’s done? Very nice! 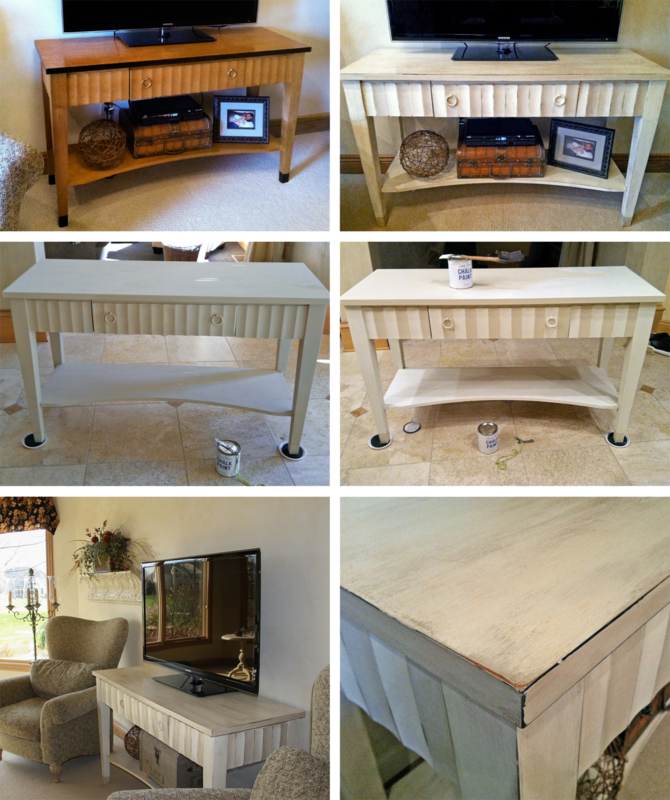 You’ve done a great job of refinishing your furnitures! Good job! Could you please let me know which colors, in which order you used for the bathroom vanity and also which wax you used? What does that wax do anyway? Hi Nancy. The first color over the cherry wood is Annie Sloan Chalk Paint Old Ochre. I believe I painted one coat. I wanted to reveal the wood underneath easily. The second and third coat is Annie Sloan Old White. Then I sanded with my mouse sander to reveal layers underneath. in this case I liked having the cherry wood show through. The wax seals the chalky paint and when buffed out, puts a really wonderful sheen over the piece. It also protects it. Dark wax ages the color. It kind of stains it like tea stains white fabric. If you look in the groves and edges, that darker color is actually the wax. I use the dark wax on light colors very sparingly. I use clear to seal the white and rub in the dark wax in corners and grooves. If you find you over do the dark wax, it lifts off easily with mineral spirits. Let me know if you have questions along the way. I am now doing my kitchen cupboards in DIY chalk paint . I am so confused on what to do after I apply everything . I am using black for the base color , then a green I mixed myself sparingly on top of the black , then on top of that will be white , then distressing after that, I do want to tone down the white to an aged look and lowered areas darker but I need protection since it’s my kitchen cupboards what should I use ? I do not want anything that will yellow over time . Girl from lowes told me to use Kona stain for the ageing and darkness I want . Can you help me out please ? What are your cabinets made off? Wood? Melamine? 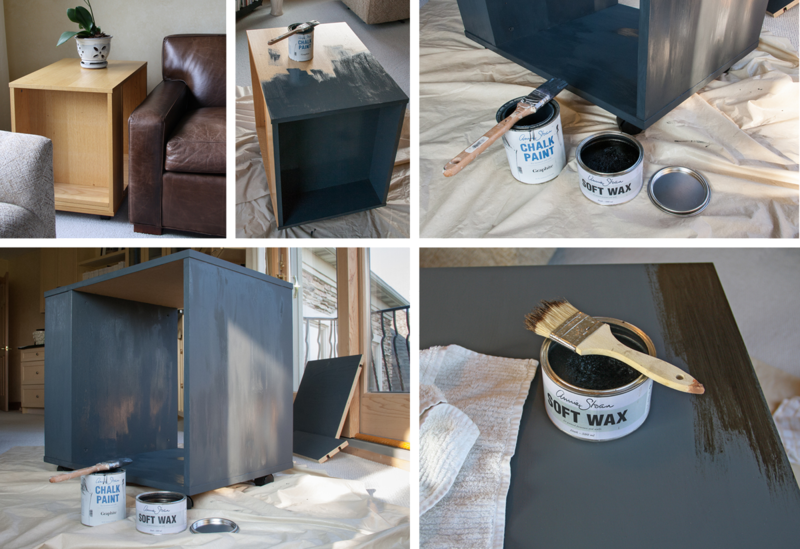 If your goal is to have the black show through, be sure too give it two coats of the black. One coat sands through quickly and you’ll go down to wood easily. Which is okay. If it’s wood and it’s the look you want. Not so much if you sand down to any other finish like melamine laminate. I haven’t used the DIY Chalk paint so I’m not familiar with it’s “tooth” – how it accepts coatings over the top of it. I have not used Kona stain either. I have used Ralph Lauren Tea Stain to glaze everything from walls to wood working and find it a bit thick. I add Floetrol to it with a bit of water to make it more workable. I also make my own glazes to hang up in the grooves of woodwork, using about 1 cup of Floetrol with a teaspoon or two of acrylic paints like raw umber and a little black. But the dark wax works just like the glazes and is easy to work with. If you don’t want it to darken the whole surface like in the video I linked to, just use dark in your cracks where you want it. Here is what I would do. Every project, no matter how experienced you are, has a learning curve. 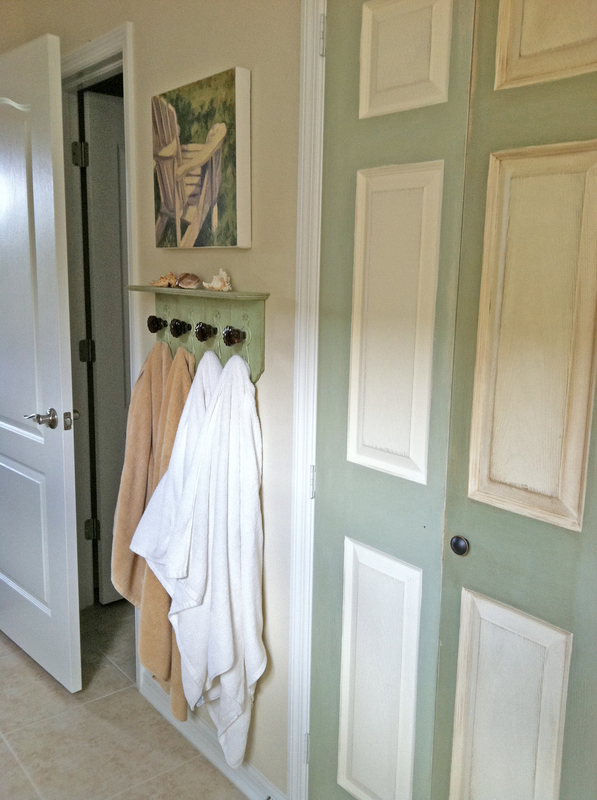 On the back of one of your cabinet doors, paint with your colors the way you plan. After all your layers are dry, do your distressing with the sander. Then divide the door into thirds with painters tape and try the glaze of your choice on 1/3. Try a different technique on each third but please try the wax from Annie Sloan. It’s pricey but I think you will love it.The clear may possibly yellow a little over time but no more than a varnish or polyurethane and it’s a much prettier finish. It can be reapplied and buffed out with a soft cloth. It can be wiped off easily with mineral spirits. I don’t think you’ll be disappointed. 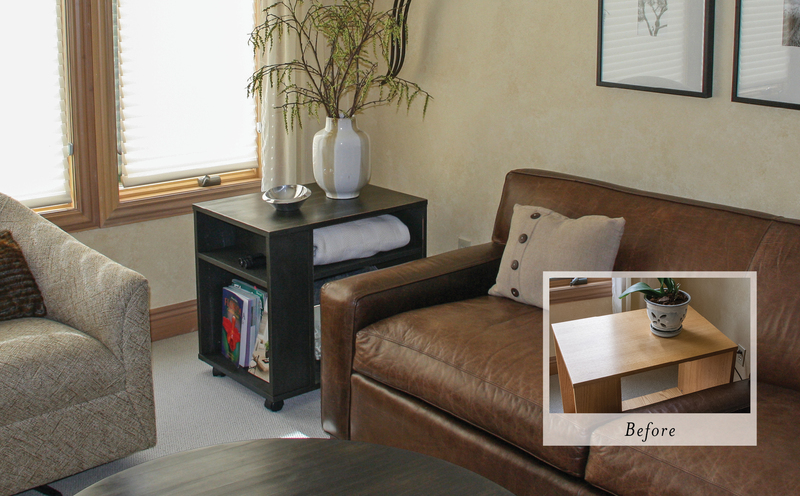 Sometimes you can also find clear and dark furniture wax at high end furniture stores. The wax protects your cabinets, seals the paint. It can be reapplied as you see it wear around often used knobs. It repels water. It’s easily cleaned. And it’s been used to protect wood and paint finishes for generations. Thank you so much I love the tutorials on there . I love the DIY chalk paint I made <3 you need to try it it's awesome I am very short on money so I gotta go cheap lol but it's turning out great ! I love the Kona stain works very well , If I can I will send you before n after photos when they are finished is that ok ? 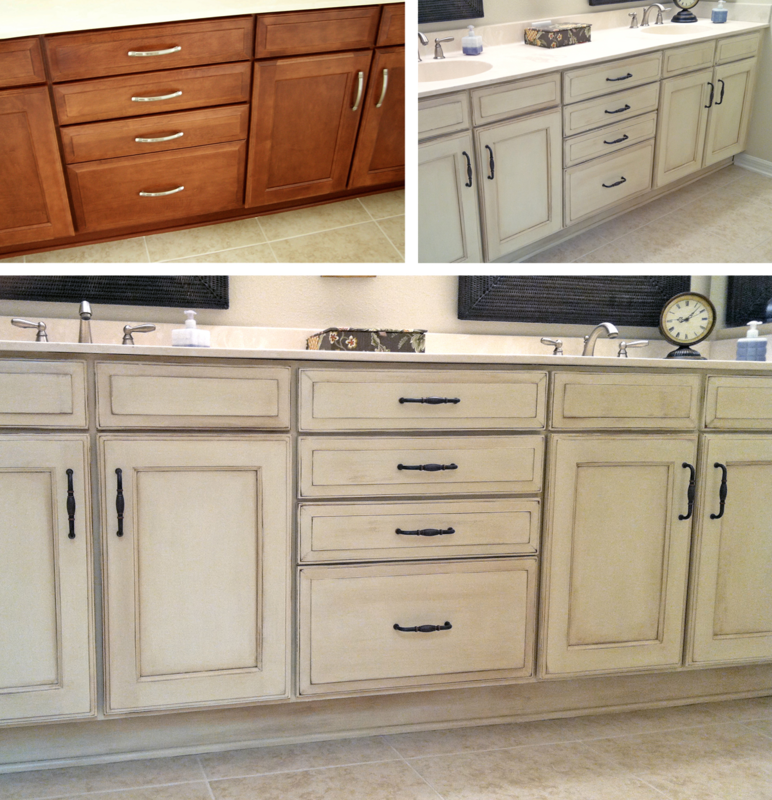 I love your bathroom vanity makeover and have been dying to do my kitchen cabinets. They are brand new, but dark espresso, which I’m not liking at all. My question is, where did you get the hardware for your cabinets? It’s exactly what I’ve been keeping my eye out for!